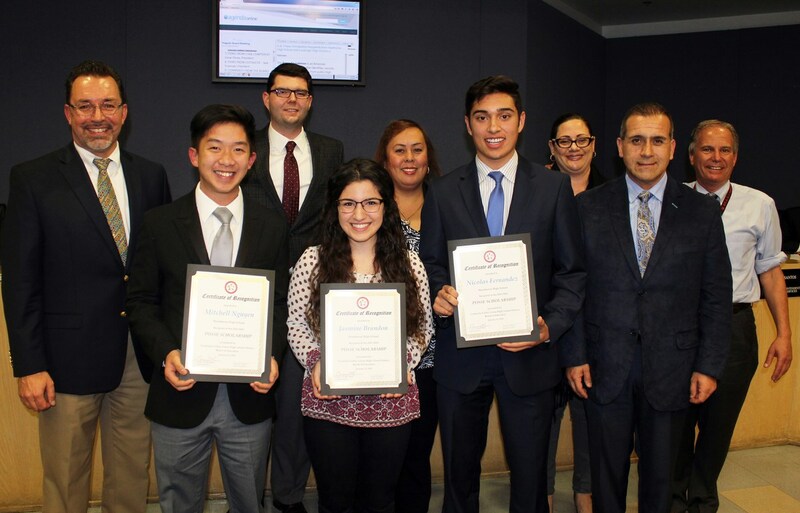 Hawthorne High School students Mitchell Nguyen, Jasmine Brandon and Nicolas Fernandez were honored at the CVUHSD Board Meeting on January 12, 2016 for being this year's Posse Scholars. Posse Scholars are awarded a four-year, full-tuition scholarship to a Posse partner college or university. Students are chosen based on their demonstration of leadership within their high school, community or family and their academic potential. Mitchell Nguyen and Jasmine Brandon will be attending University of Wisconsin and Nicolas Fernandez will attend University of Illinois this fall.